Lose him and we are looking to Carlos ‘Chip It’ Vela or heading back into Arshavin territory. So please, XXXXXXXX – no injury. XXXXXXXX is a revelation. A willing front man who can toil away happily, holding the ball and distributing it, but who has a real eye for goal, I would wager that Bendtner is now sweating a bit. Why on earth did Wenger scrimp on the £7m by waiting this long to sign him? He could have made a real difference in the back end of last season. XXXXXXX will surely be holding the line again, but that’s fine – he’s made a good start to his Arsenal career with three goals in eight. He’ll need a break at some point but if we can keep him in one piece until Bendtner or van Persie return, then he’s very much the main man. Our over-reliance on the ever-willing XXXXXXX has been another of my worries. As an appendix, my players of the season so far are Nasri (up a massive notch), Fabianski (purely for rising from the ashes), XXXXXXX (better than Bendtner) and Wilshere (staggering talent coming of age). Fortunately, XXXXXXX eased the nerves with a deft toe-poke. A quick word about Nasri and XXXXXXX. It is very doubtful had you placed a bet on the opening day of the season that you would have tipped those two to top our scoring approaching Christmas, but with 10 and nine goals respectively, they have exceeded expectations. Shoehorning van Persie and XXXXXXX into the same team is a glorious headache. So thank heavens for XXXXXXX’s impressive debut season. Mon chapeau est doffed, as they say in France. This is precisely the kind of non-sequitur / fluff piece that interlulls were invented for, I’m sure you’ll agree. I’m certain that I also don’t need to tell any of you that XXXXXXX is of course that great Houdini of strikers, Marouane Chamakh. (For a while, he did well in a box). Formerly of Emirates Stadium and now of no fixed abode. “Where are you going with this?” I hear you ask, and I answer that I’m not entirely sure, only that I recall a player who made his presence felt, could score with the head and the foot and for whom plenty of exuberant words were once written (not least, as you can see, by myself). And I suppose that some people compare Olivier Giroud to him. Because he’s from the French league, maybe, a striker and tall – but if you think about it there are big differences, and not just in price. Chamakh started his Arsenal career so well, getting something like 11 goals by Christmas, and then faded away drastically. Giroud has started his career at the club more slowly and has set himself a target of a dozen goals for the season. Chamakh scored 16 goals two years running in France, but Giroud got 25 – a huge difference. But the biggest difference is that Chamakh didn’t really replace anyone, whereas Giroud part-replaced a man who scored 37 goals. That’s where the burden is. Personally I think that Giroud is a decent player and will prove it, if he’s not doing so already, but then again, I did say that about Chamakh. a) There’s really no use in making comparisons or judging a player after ten games. It takes a season before a decent assessment can be made. By Christmas 2010, Chamakh was a big player for Arsenal. By May 2011, he was not. Will Giroud have hit 12 goals by May? I think he’ll get more than that. b) Chamakh’s decline is not only baffling, but sad. Time for top footballers to stop asking for more? And getting it? So I was listening this evening to the excellent 5live report on Arsenal’s finances, a discussion with some knowledgeable men present: Martin Keown, former Liverpool MD Christian Purslow, Jeremy Wilson from the Telegraph and Nigel Phillips from the AST. It’s a great listen and I urge you to have a crack if you’ve not done so already (not sure if it’s available overseas – it seems not). It’s a discussion that comes at a time when Rangers, Portsmouth, Port Vale, Darlington and others are struggling with the weight of debts, and overall, for all the faults and the perceived lack of ambition at Arsenal, it’s hard to disagree with the fact that Arsenal is a well-run club. (I can’t begin to summarise everything it covers – so I’m just plucking bits out). But one thing struck me, and I’ve already had a mini-rant about it on Twitter. That thing is player wages. One of the first stats wheeled out in the piece was that Arsenal’s wage bill is now double what it was in the Invincible season of 2004. That is staggering. I know it’s not specifically an Arsenal thing – it’s far worse elsewhere – but it does lay bare the principle reason why clubs struggle now to compete: wages. This season, Wenger has been criticised for not spending and for distributing the club’s money rather too equitably in some instances to players who do not deserve it. The board has been criticised for not pressuring Wenger to spend and being aloof/distant/in absentia, and the players at times have taken stick for their performances. None are or should be free from scrutiny for those things. But the real reason why clubs are struggling and money is ‘tight’ is that, year-on-year, players keep asking for more. And clubs feel they have no option but to pay it. The old argument used to be that a player’s career was short, and that he deserved a crack at top wages until he was 35 so he could retire with enough money to start a business or run a pub or something. Now though, we are talking about players who earn millions a year and who will never have to work again. Look, I know the reality: that’s market wages. If I was offered double my wages, I’d take it too. If you stand up to your players or their agents, your players will move on. And I am not criticising Arsenal players over any others here, because at the top level they’re all the same. But surely, it has to end soon? For how many more years can wages rise in the way they are currently rising? At a time when the country – and much of the continent – is flat broke, is this sustainable? And what can be done about it? Rant over. In the meantime, I point you once again to the 5live special, and for some additional food for thought, The Swiss Ramble is (as ever) worth a look on Arsenal’s finances, as is this piece from @behnisch. But all these new revenue streams, these increases in prices for fans and so on, it’s mostly all down to burgeoning player wages. It’s got to stop. And erm – up the Arsenal! He’s gone missing. Injurepol have been alerted but there is still no sign of our no-minutes-on-the-pitch midfielder. If spotted, feel free to approach him. He’s completely harmless. Six appearances for Sao Paolo, three red cards. That’s some work. One can only speculate what it was that has unleashed the beast in Denilson, but he’s gone all Razor Ruddock on us. Topping it all off, the man whose chirpy ‘Bom Dias a Todos’ pipes out on Twitter at the same time every day seems to be scrapping online with his own fans too. On balance, I think he’s best off where he is for now. Sixth is not bad. Plenty to work on – I think we can catch Bolton. Missing the authentic matchday experience? Make yourself a slice of pizza, pour yourself a pint of Carlsberg into a plastic glass and charge yourself £9. (Apologies for this, but I’m a bit bored and a bit unemployed at the moment). Apropos of not a great deal, on the day when yet another home shirt was revealed, I thought I’d share this with you. I was digging through some old stuff today and came across the Gunners Shop price list from the 1986-1987 season. It’s one of those occasions when 25 years seems an entire world away. Compare the commercial operations of Arsenal now with this. There was no internet, of course, but you could go in person to the shop (behind the Clock End and the size of a shoe box) or you could send off a cheque/postal order. Note: NO COINS PLEASE. As for needing to see pictures of the products – well there’s no need for that, is there? We all know what a Baby Doll Nightie Set and a Sing-a-Long Record (4 songs) is, anyway. 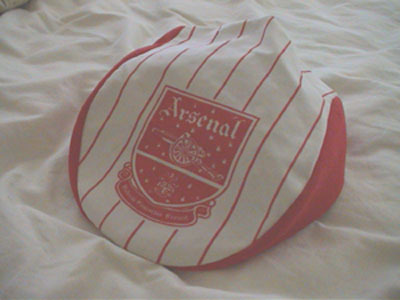 It also means I have found out what I paid for my ‘Kenny Sansom’ acrylic flat cap – £2. Apparently, it’s a ‘cheesecutter cap’. So there you go. Incidentally, tucked into the price list I also found these. And now for something completely different. Thanks to the folks at HarperCollins Publishers, I’ve got two signed copies of Paul Merson’s autobiography – How Not To Be A Professional Footballer – to give away. For all his flaws, in his pomp the Merse was one of my favourite players at Arsenal, so I’m looking forward to reading this one myself. Anyway, to stand a chance of winning, all you have to do is answer the question below. How many goals did the Merse score for Arsenal? The winners will be selected at random and notified by email. I will announce the winners on the blog. When it comes to advice on the pitfalls of life as a professional footballer, Paul Merson can pretty much write the manual. In fact, that’s exactly what he’s done in this hilarious new book which combines moments of glorious comedy with poignant soul-searching – but mainly glorious comedy. Merson was a prodigiously talented footballer in the 80s and 90s, gracing the upper echelons of the game – and the tabloid front pages – with his breathtakingly skills and larger-than-life off-field persona. His much-publicised battles with gambling, drug and alcohol addiction are behind him now, and football fans continue to be drawn to his sharp footballing brain and playful antics on SkySports’ cult results show Soccer Saturday. The story delights and entertains with a treasure chest of terrific anecdotes from a man who has never lost his love of football and his inimitable joie de vivre through a 25-year association with The Beautiful Game.